The generation born on television and raised by MTV appreciates those talented individuals who make music for the sake of its art. Billy Howerdel co-founded A Perfect Circle with just the inspired sense of catharsis in mind; he sought and still seeks to better understand himself through the medium of his art. The logo itself describes the relationship between co-founders and how one circle can work well within another. AMG chatted with the frontman to ask him about that and more. Tell us about the logo design for A Perfect Circle and the creative input you had on that. “A Perfect Circle was everything to me in 1999. I devised the runes and asked an artist to create the font. There were two fonts; an ‘elegant’ and a ‘Mayan’ and the ‘elegant’ font stuck. I also designed the original logo of a symbol, which outwardly looks like a larger and smaller crescent, but actually holds two perfect circles. When he lays out the tracks for what will become APC songs, alone in his studio or at his computer, Howerdel lets emotion and feeling guide him. Can you describe the creative relationship between yourself and Maynard or between your compositions and his lyrics? A lot of the music and songs were complete before I had shown them to anyone, but the songs took on a different shape once we started playing them as a band. When Maynard put down the vocals it became another thing. It’s a scary thing to let go of a song and stop working on it. “Judith” was originally called ‘Deal,’ that was my working title. I wrote it in one night; the night of Paul D’Amour’s birthday party. It was a song of appreciation from influence of a mentor. Rob Halford said (at a later date), ‘release “Judith” and you’ll sell a million records’ and the record company also latched onto it as a single. Maybe it had to do with typical music for the time and the lack of a chorus. I thought “3 Libras” was the strongest song for a single. The song “Vanishing” had a working title of ‘test’ which caused it to get lost on my computer. It wasn’t found until 2001 and it ended up on 13th Step as Vanishing’ with the lyrics humorously jabbing at the fact that the song was lost. Do you ever look back at your creations to determine what it was that came out of you? I remember moving into a new place, shortly after the 9-11 attacks in September of 2001, with the construction workers still finishing up outside as I powered on my gear. With bass guitar in hand, “Blue” just came out of me; I recorded the whole thing in one take. The feelings of “escape” and “fearing the worst” poured out as if from a dream or trance state. It was a very personal experience, sitting in a dark room staring at a computer and using a 4-track. The working title for that song was “Red.” I don’t remember if I ever told Maynard what I was thinking when I wrote it or not. My songs don’t have a meaning per se; I named the songs by what just happened. They are like expletives or emotional outbursts. Sometimes, Maynard happened to keep the working title; “Rose” was about my mother, I remember, because she had just visited me. What about your side project, ASHES dIVIDE? This project is a continuation of writing and my soul searching process. I’m writing not only music but lyrics for this project – and I sing. I have a new appreciation for singers after the ASHES dIVIDE tour! Being a singer is different for everyone, pushing through the nervousness and not knowing if the voice will be there night after night – it takes more heart and constitution. It’s not like digging ditches when if you’re tired you can just stop. The emotional part of singing makes it both difficult and important; getting to the ugly core of a true thing is beautiful but painful. With these songs, I want to create something more purposefully upbeat and faster as opposed to the mid-tempo, heavy things. “The Stone” was originally written for APC but became the single for Ashes. Can we expect new music from A Perfect Circle or ASHES dIVIDE any time soon? I’m working on both projects at the same time; on the APC tour we will be playing at least one new song, maybe more. Maynard wants to write a collection of songs and give them out in small bites in a succinct thread of consistency. For Ashes, I like the album experience. 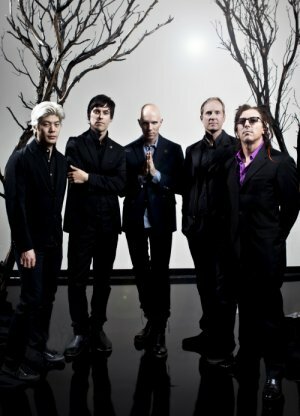 A Perfect Circle play a SOLD OUT show at The Tabernacle on July 20.